Hungry? Take a bite of some of the delicious fruits from Fortuna Fruits slot. Another great and simple pokie published by the veteran company of the casino gaming, Amatic. It was established in 1993. Secured place for over 20 years in casino business is enough of proof that they are doing good job. Fortuna Fruits slot is nothing but the product of it. It is one of the many in the ocean of fruit typed slots but the elements are combined in a way to make it a little bit unique and different from the other slots. The game features 5 reels and 50 paylines. It is easily accessible online via couple of sites such as Money Online Slots or Amatic webpage. The gambler can play free Fortuna Fruits casino slot machine without the requirements of downloading and registration. It is available for all kinds of platforms such as desktop or mobile ones. The option for real betting allows the gamblers to make some real money while having fun spinning the reels. The one can play Fortuna Fruits slots UK casinos which are the most advantageous as they have the best betting and banking options. 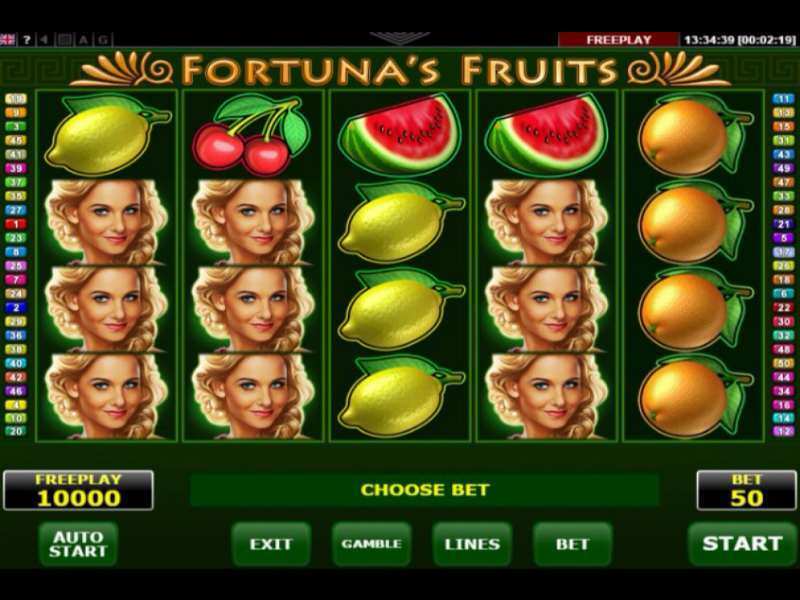 The Fortuna Fruit slot’s theme has a classical design and all the characteristics of a retro style. The background is made minimalistic so there is nothing shiny or sparkly that can interrupt gambler’s focus, so it is easy to concentrate on the actual game. There are no fancy graphics or 3D animations involved. The imagery contains mostly fruits and a couple of different looking symbols. Surrounding sounds are not distractive either, and the player can only hear them when starting the game. Another occasion for that is when the player lands the winning combination. The most valuable one in here is a card with the image of a lady on it, and right next to it stands the juicy watermelon. The winning combinations are paid from the left to the right and the first symbol of the winning combination has to land on the first reel. The special group involves the wild card, and unfortunately the scatter card is not incorporated. The image on the wild card suits the reward that it can bring. It looks like a bag full of gold and it can certainly make the player’s pockets full. It substitutes for any ordinary symbol in order of achieving the win. As already said, it is one of the many fruit typed slots. Its uniqueness can be seen during playing. Besides the casual gambling, the player can take the risk twice. Every time a player makes some coin value there is an offer to bet the win one more time and make more money. The player can also play it safe and take he has earned in the first place. The ones who are willing to take the risk of profiting or losing it all are welcome to press the gamble interface button. When that is done, the gambler is taken to another betting room where he has to guess which card is on the table positioned face down. There is an option to choose between the red or black cards. If the player guesses right, the amazing rewards are going to be received. The betting range is not very wide and it is optimized for its own gameplay. That is made that way because of the gamble option and there is a bigger risk for a player to lose money. The minimum coin value that can be put in the bet per every line is 0.15 and the max is 0.2. The fastest way to take a bite of some delicious fruits and make money is to spin the reels as many times, put out calculated bets and gamble smart. Unfortunately, Fortuna Fruits online has no bonus round in its gameplay. The 50 paylines are the only thing contributing to the player’s success because the wins are constant and return to the player percentage is rather high. Another thing is the size of a possible jackpot. When playing for the real money, by putting 10$ per line the player can earn amazing 60 000$.The risk is high to lose the safe money during the gamble feature so the player should only use it when the amount of earned money isn’t enormous. Yet, you never know, everything depends on luck and maybe today is your lucky day! In the ocean of the fruit slots, Fortuna Fruits shows its uniqueness through the gameplay as it comes with an interesting gambling feature. The game is perfect for the lovers of tasty rewards and jackpots. If the player is in search of similar games like this, we recommend the Fruit Salad. 0 responses to "Fortuna’s Fruits Slot"